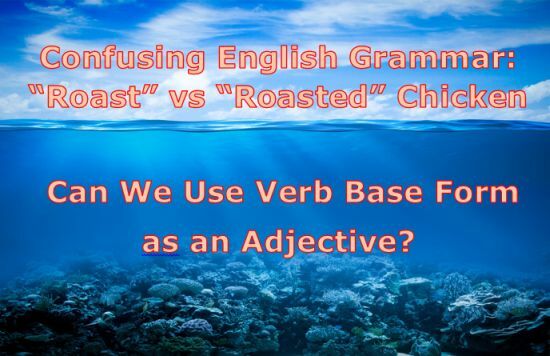 Confusing English Grammar: “Roast” vs “Roasted” Chicken – Can We Use Verb Base Form as an Adjective? It was almost 5 years ago when I published an article about using past participles as adjectives – a typical example of that would be the following statement “the job is done”. Prior to that I was constantly struggling to wrap my head around that concept, the reason being – I couldn’t figure out why there’s two ways of saying the same thing – “the job is done” and “the job has been done”. Today’s topic is somewhat similar in that the role of an adjective isn’t only limited to a past participle form of a verb, it can be the very base form of the verb itself! Just like you read in the title of this article, the word “roast” (it’s the base form of the verb “to roast”) can be used instead of the past participle “roasted” to describe the roasted nature of the chicken, thus “roast chicken” is a totally valid English collocation. Hell, collocations such as “roast chicken” and “roast potatoes” are even MORE popular among native English speakers than “roasted chicken” or “roasted potatoes” which may be very confusing to a lot of foreign English speakers! So – when you read or hear someone say “open book” – you’re experiencing a conflict of clashing opinions. On the one hand, you realize that it’s pretty much impossible that everyone would be saying it wrong, but on the other hand you’re trying to figure out why you couldn’t say “opened book” since “opened” is the past participle form of the verb “to open”! …. it doesn’t strike us as wrong? Now, here’s something I learned a long time ago. There’s simply no point in trying to ask such WHY questions because you’ll end up developing a truly debilitating habit of trying to figure out what every word in a sentence means in grammar terms! STOP trying to use a blanket approach when applying a specific grammar rule. There are ALWAYS exceptions to the rule, so whenever you come across an exception such as “roast potatoes” or “open window” – just ACCEPT that it’s said this way in English and don’t question it. If you think about it, you’ll find plenty or irregularities in your own language, but surely you don’t question them every time you speak, right? So, simply accept the fact that sometimes you can use the base form of a verb as an adjective and just stick it right in front of a noun, and learn such collocations one by one. And why not start doing it right now? ROAST CHICKEN, ROAST POTATOES – just like we discussed in the beginning of this article, this is how native English speakers refer to chicken and potatoes that are roasted. Bear in mind though, it’s not incorrect to say “roasted chicken”, so if you happen to say it – don’t worry, people won’t even notice it. Interestingly enough though, when it comes to roasted vegetables, it seems that native English speakers tend to favor ROASTED VEGETABLES over ROAST VEGETABLES – go figure! OPEN WINDOW, OPEN BOOK – unlike the previous collocation where the adjective can be either the past participle “roasted” or the base form “roast”, word combinations with the adjective “open” are much stronger which means that if you were to say “I can read your mind like an opened book”, it would actually sound a bit weird. Native speakers would only say “I can read your mind like an OPEN book”! Similarly, if you have to describe the fact that the window is open, you won’t say: “I’m looking out an opened window”. It would come across as odd, so definitely stick with the OPEN window! COMPLETE – I can come up with loads of collocations containing this English adjective – COMPLETE CONTROL, COMPLETE HISTORY, COMPLETE AGREEMENT and truth be told, you probably wouldn’t even try to use the past participle “completed” instead because it would just sound plain wrong! “Completed control”, “completed history” and “completed agreement” don’t even make any sense, and chances of you trying to use the past participle form “completed” instead of “complete” are really slim, but still it’s worth mentioning it – in case some of you try to do it. SELECT RANGE OF – this collocation contains the word “select” used as an adjective, and it’s used to describe a specific range of something chosen for its quality, such as “a select range of products”. CORRUPT POLITICIAN, CORRUPT BANKER – this is how you’d typically refer to a politician or a banker who’ve been known to have accepted bribes. I know – you may be tempted to use the past participle “-ed” form to describe such a person: “corrupted banker” – but it’s just one of those exceptions you have to learn! And again – while you can use this adjective to describe a file or a hard drive that’s been corrupted, it’s more common to say CORRUPTED HARD DRIVE than CORRUPT HARD DRIVE. Basically it’s pretty much the same as using the adjective “roast” – it’s “roast potatoes” whereas the vegetables are most commonly referred to as “roasted vegetables”. This one is an exception among all others for the simple reason that it’s not the base form of the verb that’s being used instead of the past participle (it’s not BREAK vs BROKEN) – this time around it’s the simple past BROKE that’s being used instead! You might have heard the English expression IF IT AIN’T BROKE – DON’T FIX IT – and perhaps you wondered why they use “broke” instead of “broken” in this expression. Surely they would sound more correct if they said “if it ain’t BROKEN – don’t fix it!”, right? Well, it’s just another one of those exceptions you’re just going to have to learn, and bear in mind that occasionally native English speakers even use BROKE and BROKEN interchangeably – they may say “my car is broken” or MY CAR IS BROKE meaning the very same thing. So, if you find yourself in an information situation with other English speakers, it won’t be a big deal if you used “broke” instead of “broken”! SUBJECT TO TERMS AND CONDITIONS – I bet you’re familiar with this English phrase – after all, it’s used in commercials and advertisements all the time. So, what’s special about this phrase is the fact that in theory you could use the past participle of the verb “to subject” to describe the fact that something depends on terms and conditions, but in reality the base form adjective “subject” is used instead. Another typical phrase where “subject” is used as an adjective is SUBJECT TO AVAILABILITY – which means that the goods in question are available while stocks last. SUBJECT TO ABUSE is another collocation containing the adjective “subject” and it’s used to describe the very fact that a certain group of people, for example, is prone to get abused. Funnily enough, when you talk about a specific case of abuse, you’re much better off using the past participle “subjected” – “The little boy was subjected to domestic abuse that lasted for years!” – simply because in this case you’re referring to the very action that was ongoing for years so you have to use the past participle form of the adjective. Well, the best advice I can give you is – simply memorize the select few (see how I used one of those aforementioned collocations?) 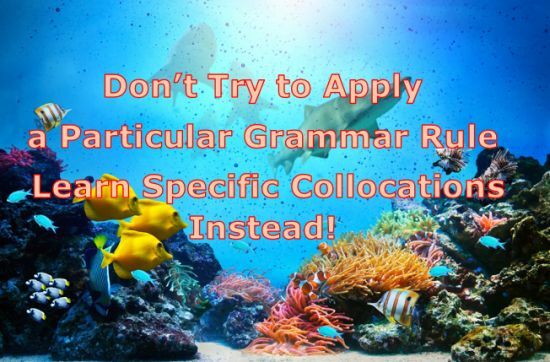 collocations where the base form of the verb is used as an adjective, and don’t analyze the whole thing too much! And if in doubt – use the proven strategy of looking up word combinations on Google to find what way native English speakers are more likely to use a specific adjective – the base form or the past participle. Leave them in the comment section below and I’ll get back to you as soon as I can! That’s a very good point, thanks for pointing it out! Truth be told, I wasn’t even aware of the existence of two different words, I thought there was only one word – жареная! Suddenly it came to my mind that we may have a very simiral rule in Russian. ‘roast chicken’ and ‘chicken roasted on a grill’ is like Russian ‘жареНая курица’ и ‘жареННая на гриле курица’. In the first expression ‘roast’ and ‘жареная’ are adjectives. In the second it’s a past participle form of the verb in English and an adverb in Russian.